You can now browse through 175 issues of The Stentorian, the North Carolina School of Science and Mathematics’ (NCSSM) student-run newspaper. NCSSM is a residential high school located in Durham, NC. It was founded in 1980 to provide a two-year public education to high school students focusing on science, math, and technology. The Stentorian covers student life and school events spanning the last four decades, from 1981 to 2017. Highlights include drama productions, additions and changes to campus, sports, student government, staff news, and prom do’s and don’t’s. The student journalism also extended beyond campus boundaries to include current events, such as this article on the history of the Islamic State, and this article on the hazards of social media. With a unicorn as their mascot, the paper is filled with unicorn-themed images, stories, and Uni-pride. 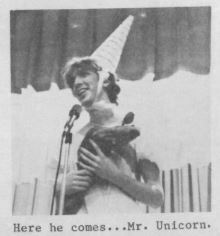 Mr. Unicorn, from November 1, 1982 issue of the Stentorian. 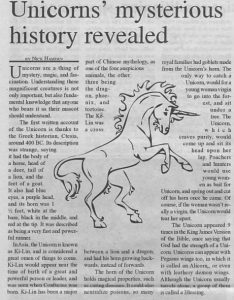 Unicorn article from December 1, 2005 issue of the Stentorian. These issues provide a glimpse into the lives of the students, teachers, and staff, and the activities that defined their time at NCSSM. From a student perspective, the Stentorian gives us a not-so-long-ago history of this unique campus and the world. These student newspapers complement the already digitized yearbooks from NCSSM. To browse through the yearbooks and newspapers available from NCSSM, check out their partner page.